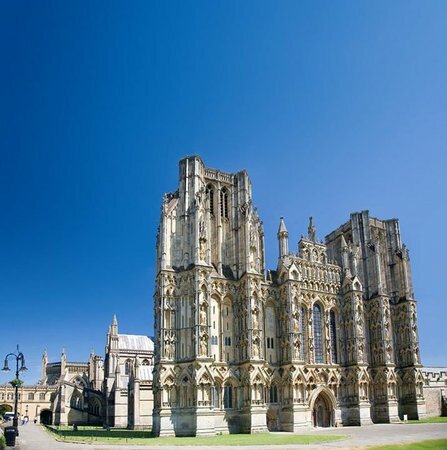 Description:Choral Evensong is held in the Quire of Wells Cathedral and today is sung by St John's Choir, Glastonbury. St John's choir is made up of a large group of adults and juniors which sings regularly for the services in St Johns Church, Glastonbury. Under its Director of Music, Derek Dorey, it has developed a wide repertoire, singing anthems and setting at all sung services. In addition the choir sings regularly in Cathedrals Exeter, Salisbury,Hereford and our own Cathedral of Wells. The Church considers the training of Organists important and with the help of the Cathedral School in Wells and the Wells Cathedral Organist has been able to develop an Organ Scholar scheme whereby each year an organ scholar is appointed to work with the Director of Music to gain experience in working within a parish church. This service is open to the public and all are welcome.